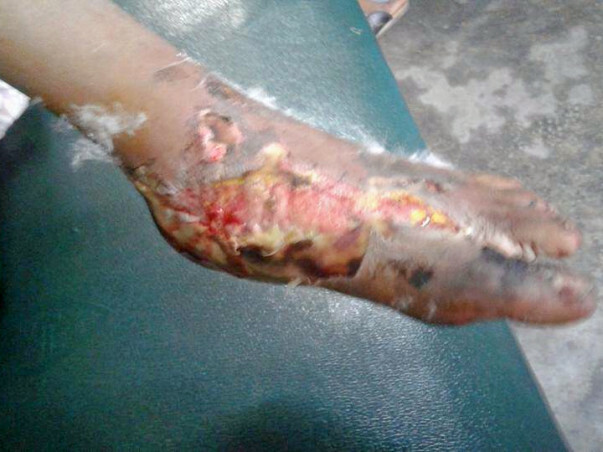 Help this 10-year-old girl so that she doesn't lose her leg ! Priya Banerjee, a 10-year-old girl, became a victim of a road accident along with her mother at around 6:30 a.m. on 23rd November 2016. A bus, while overtaking another, ran over their feet. 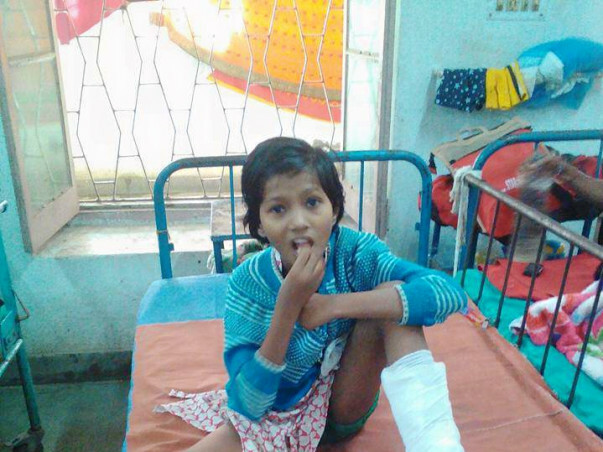 Her mother is now almost out of danger but Priya’s right shin bone is seriously damaged. They received primary treatment in NRS Medical College, but the doctor recommended that she undergo Plastic Surgery to save her leg. Her mother, though out of danger, will need a plate in her leg before she can resume a normal life and thus, will be out of her livelihood for the next 3-4 months, at least. I was truly astonished when I first heard about Priya and her mother’s daily struggle. Priya’s mother works as domestic help in several households in Kolkata's Beliaghata locality. Her father died last year. They stay in a nearby slum area and travel to Beliaghata everyday at around 6 a.m in the morning. Priya accompanies her mother, carrying her school books, school dress and a spare dress in a bag. After a long hard day at work, they return home late in the evening. 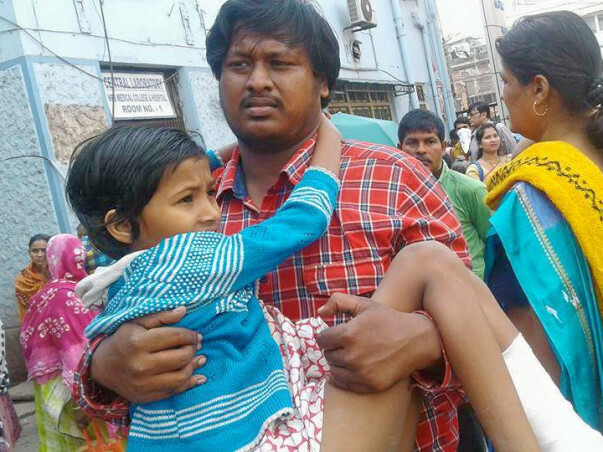 Right after the accident, Priya’s mother lost consciousness, but Priya was alert despite the blinding pain and she pleaded with the police – “Please take us to the hospital. Please take my mother's purse along or else we will starve”. Srijal's news was a blow to the Mission Arogya team. But we have much good news - One of them is regarding Priya and her mother. Both of them are almost cured and walking without a crutch. In-fact, the plate in her mother's leg has been removed and she can walk with the clinical grade pump-shoes. Though we asked her to rest, she has gone back to one of her domestic help jobs- she promised that's the only one for now. On the other hand, Priya still needs to have the plate in her leg. So, though she can walk without the crutch, she cannot go back to school. As such, she was getting very depressed. We contacted her school and her school's Asst. Head Mistress visited her place. 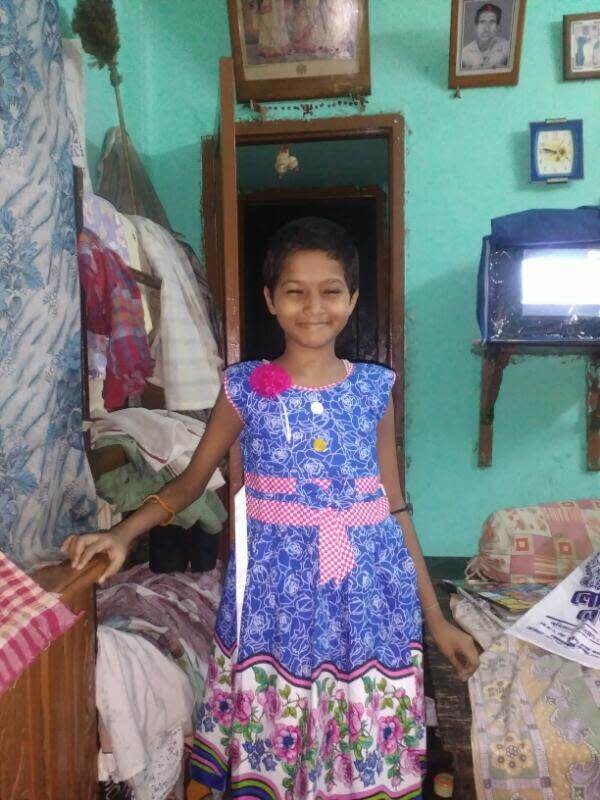 She allowed her to study from home - but as Priya is lagging behind a lot, the next thing she did was just awesome - she arranged for a Teacher, completely free of cost !!! Not only that, they are still staying in Priya's grandmother's place in Beleghata as it is easier for her mother to go to work, to visit the doctor etc - But most importantly, they don't have to pay anything for rent. The room that they rent at the other side of Bypass, has been kept for them under lock and key by the landlord, completely free of cost. The people in the locality are just so happy to see both of them on their feet, walking, leading a normal life, which was under severe threat just 9 months ago !!! As such, it's not only the treatment and the surgery, it's the support, the compassion of the society which had made all the difference. Obviously, we will always be indebted to the doctors, surgeons, nurses and the dressing guy, who did provide an awesome service at home continuously for 3 months. A big thank you to everyone who came forward to help us in our difficult time. Priya is doing great. Her legs are almost healed. But the bandage, usual doctor visits etc will continue for near future and the crutches will be needed. Also, hopefully within few months she will be back at school. Till then, we are ensuring that she can continue with her study at home. A picture is worth thousand word. So here is a very clear picture of Priya - all smiling. But with a crutch and her mother still in bed , we are not sure of that yet. Till she can go back to school, we are arranging for books etc at her home. We are trying to for private tutor, who can come over and teach her - but with the rising cost the private tutors at home are really costly, specifically when her family doesn't have any monthly income. It will be great if we can find volunteer teacher(s) in Beliaghata area !!! On the other hand, while her mother's injuries were much less, but those are taking a while to cure completely. So the same dressings are being continued. May be due to the age, she is taking time to cure. We are continuing with both of their medical care at home. As well as support for their family as Priya's mother can't go back to work right now . So will urge to continue with your support and obviously with all your prayers and blessings. I hope to get good news this time, I can't say how I felt after hearing Srijal's news. All my good wishes and prayers are with this girl. Wish her family all the best.